Albion Online is sandbox MMORPG being developed in Germany by a small company called... uh.. Sandbox Interactive. There isn't much to say other than it offers a lot of the things you would expect from a sandbox MMORPG, meaning permanent housing, classless characters, lots of crafting, heavy PvP and full loot, player driven economy and so on. Seems like they are doing PvP with some bits of EVE in mind, with zones of three colours, Green (safe), Yellow (not so safe), Red (free for all), with the red ones having the best stuff, resources, etc. At the same time, they are implementing some interesting anti-zerg tools, basically making zergs visible on everyone's map, and literally debuffing players running around in a zerg (they take more aoe damage). There's a lot of positive buzz around this one, but at the same time there are a couple of obvious issues. The first being the graphics, clearly dated, stylistically questionable, and overall just not cool. The second is supposed to be a strenght but I fear it will eventually be the cause of an infinite amount of problems and delays on top of dumbifications of all sorts, and it's the cross platform nature. That's right, Albion Online is supposed to work on Linux, Max, PC, Android and iOS right from the get go with all these platform playing together on the same servers. If you read to this point you may as well decide to take a look at their roadmap for the next closed Alpha. It illustrates very well what are they trying to achieve and what problems thety have already discovered and how they are trying to tackle them. Personally I appreciate that they are not granting constant access to the founders. This way they can really pack a lot of new stuff between builds, instead of little incremental steps that give the impression nothing is really changing. I watched a lot of the last alpha of this game. It was impressively smooth for the parts I saw. I'm very interested in seeing how this develops because it looks like one of the few well done PVP games coming out. I've been clamoring for a game like this for a while now, so I'll definitely keep an eye on it. That was fun! Flashback to Shadowbane where I ran away the entire time I played. I was super squishy but boy could I run away! I might have to play this, too. Tried it out. It felt like the gameplay and combat suffered to make it work on tablets. The structures only served as crafting stations except the bank which was a bank. It certainly wasn't the sandbox mmo that I've been looking for. I believe it's inferior in quality to UO. There's no reason to play this game over a UO emulator. Instead of sandbox it might be better classified as a simulator... Grinding simulator. You will spend thousands of hours of chopping wood/rocks for upgrading buildings or making gear. Ugh. That doesn't sound good at all. Aww, LC, you always dash my hopes with PvP game. Nija, too. Can't you lie to me? Matt Woodward, also known as CCP Greyscale on EVE, just joined the team as a game designer after leaving CCP back in 2014. He's gonna work on the Guild vs Guild stuff apparently. He's also not particularly well liked by the EVE community. He basically made a lot of 'it's only a sandbox if you play it my way!' decisions. We're glad to see him go. Doing something more interesting while playing Eve for at least 9 years. Keep on multitaskin' and reading about glory. There's a reason he chose Delirium of all the Endless. This game just entered into a late stage of open pay-2-play beta. I've been watching a few streamers (i.e. Kripparian) play this and wondered if anyone here was considering it? It seems very group oriented, so getting a Bat Country group together might be a thing. I haven't paid this game any mind. Why should I pay attention? It's a crafting-centered MMO with PvP and the normal grind. Nothing too exciting beyond the ability to play it by phone/PC/Tablet. I heard it's pay to win where you will never compete unless you're in an uber guild and spending cash to speed things s up. I've watched a few streams. It's really boring, more so than the normal MMO. I never saw anything interesting happen. Lots of horse riding and walking. Well, this game is now pretty fun. It is still gonna be wiped in July, so I would suggest to wait at least after the summer before trying it, especially since it's not cheap, but they have really ironed out a lot of the concept that were terribly executed one year ago, and the end result seems quite enjoyable with a group. I can't speak for the end game, as I am far from it, and in case you were wondering yes it still feels a lot like a gathering/crafting simulator with a basically endless grind if you feel like learning to gather and craft everything. But there's much more content, a lot of stuff to craft and a lot of specializations and sandbox stuff to take care of, plus the obvious PVP layer that is a mix of EVE and Ultima Online. In fact, the entire game is (by Devs' admission) intended to be a mix of EVE and Ultima Online. Too bad for the 90's graphics and combat, that's my biggest gripe at the moment. There are some nifty touch, like the ability to create alliances among guilds, something that has been unavailable in too many games since Shadowbane, and the inability for large groups to hide and sneak-zerg you as they will show up on the minimap from a distance. Also: not really pay to win. You "need" the monthly subscription to progress at a normal rate (which is about 13$/month), and you can buy in game money with real money, but that's true in every MMORPG in existence nowadays except here you pay the makers of the game instead of the Chinese goldsellers. We are developing an exciting new feature where all mob item drops will be player crafted - yes, you read that right. The way this works is that all items that can drop from mobs need to be supplied to an NPC black market first. The black market in turn creates demand based on mobs being killed. If the black market’s demand is not met for certain items, prices will increase, until a player is willing to sell the requested item to the NPC. Items sold to the NPC will then enter the drop pool, i.e. mobs can drop them based on the usual loot tables. However, the black market NPC is somewhat corrupt, and some items sold to him will be “lost”, hence creating a nice item sink which will be very important at the lower tiers. If we can make it work, you’ll even be able to see which player originally crafted the item that just dropped from the mob you killed! That is a lot of thought put into a feature whose existence is indeterminable by players. That's the definition of modern design in any field. So, I'm in this. I'm running with AUSEZ (IGN as Iron Wolves). Ran with Covetous Crew in beta 2 and they may end up with AUSEZ as an alliance. I dunno. Anyway, I dunno if it looks like there's anywhere near enough interest for a Bat Country, but if you want in what I think is a good stable crew, check in. Actually, it is. The opening frame of the two last betas has been a lot of fun, but to be fair I always enjoy server opening rushes. There really are multiple routes to being a success. There's need for crafters, need for gatherers, need for PvErs, need for PvPers, need for small group actors and need for zerglings. You can be relevant in PvP in solo, duo, 5x5 or zerg. Hell, there's even need for builders and decoraters, because I sure don't want to do that. I guess what makes it stickier for me than other recent stuff (Agnarr, MOBAs, phone games) is that interaction is necessary. To get anywhere serious, you're going to have to find a group and find a role in that group. Being necessary - even if it's just for crafting cleric hats - is fun. Game has a killboard, Slayerik. Falc, what's your latest opinion on it... 30 bucks is hard to come by these days for ole Slay! It is fun for three days if you play solo, fun for a month if you play with a small group of friend, potentially fun forever if you play with a large guild/alliance. If you don't have large numbers, after a while there isn't much you can do other than gathering and crafting forever. It really is a lot like EVE in its first couple of years. I don't think I'm a MMO player anymore, though. Twelve hours, ya'll! If anyone's still looking for a crew, just start in the Forest area and hit up someone with the Sovereignty tag. It really is a lot like EVE in its first couple of years. To be fair, that's one of the game's explicit design goals. They even hired some ex-EVE design staff. I have, surprisingly, 50+ hours in this game already, so safe to say I got firmly sucked in. Launch was quite smooth. There's a good amount of things to do and since everyone is concentrating on either raising fame(xp) or silver while being generally clueless in the race for better opportunities there are a lot of lucrative chances one can take. Friend of mine already made a million silver on his second day. It's true that Eve players can enjoy the grand aspect of the sandbox while everyone who's played Dota or LoL will feel right at home with the combat, except the numbers go up and the battles get hectic, but from what I feel is being in a few group fights on both winning and losing end is that it's rather well balanced since tactics and composition can negate numbers. A few missing healers and you're at a strong disadvantage. PvP is really good in this game and I've never even been a fan of Dota-esque games. I have to say that the entry to high-end areas is very very low, as is the entry to gank and rob people. I already got tier V gear unlocked and I've been smashing rocks out of the ground like an idiot for most of the time and just been exploring the different zones. And tier V gear isn't that much better from tier IV considering current prices. Do play this with friends though. Make convoys or engage in highway robbery instead. Just remember that horsethieving is a hanging offense and you can quickly lose access to blue zones when you kill non-reds. If you are looking for fair fights 5vs5 Hellgates are made for that and I heard they will be releasing 20vs20 Hellgates soon. Gathering is not a good way to make money. I'm doing it just to get the skill up and get out of dodge. Prices fluctuate between towns wildly, so pay attention to the market. Remember you can quicktravel between towns and player islands while naked. I'd get a tier 2 island asap and start farming since food is really scarce right now. Another good idea is to always have a spare mount in case you lose yours. 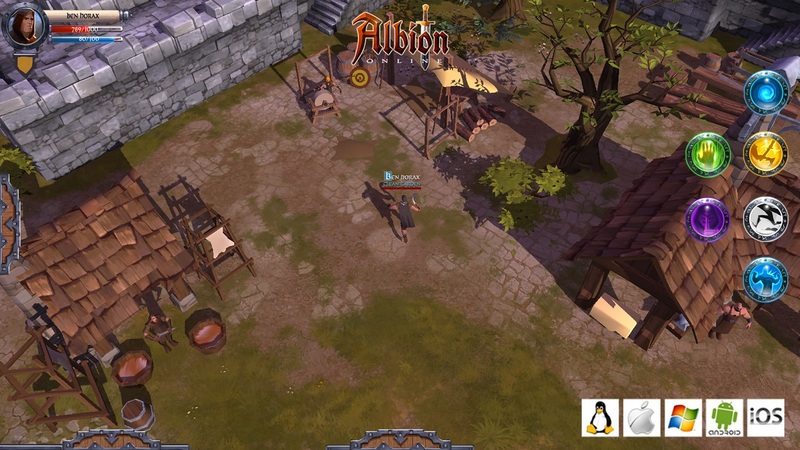 https://albiononline.com/?ref=D9VF46TNMF is my referral link if you're going to buy one of the starter packs, which is highly recommended since you get 200 learning points + 20/day (less grinding). I'm happy to help anyone with getting started or finding a group to play with.